Andy made blueberry pancakes this morning, and then the three of us set out – Andy and Kirsteen on mountain bikes and I weighed down with 10 days worth of food plus leftover brownies and grilled chicken from last night. After my grocery run in Smithers, I had to pack and repack meticulously several times to make everything fit and balance the weight evenly. My bike was so heavy this morning that I was grateful to be able to draft behind Andy and have an almost-all-downhill day (following the river) to get used to the extra weight. At Moricetown, about 12 miles down the road, Andy and Kirsteen peeled off to do a loop back home. 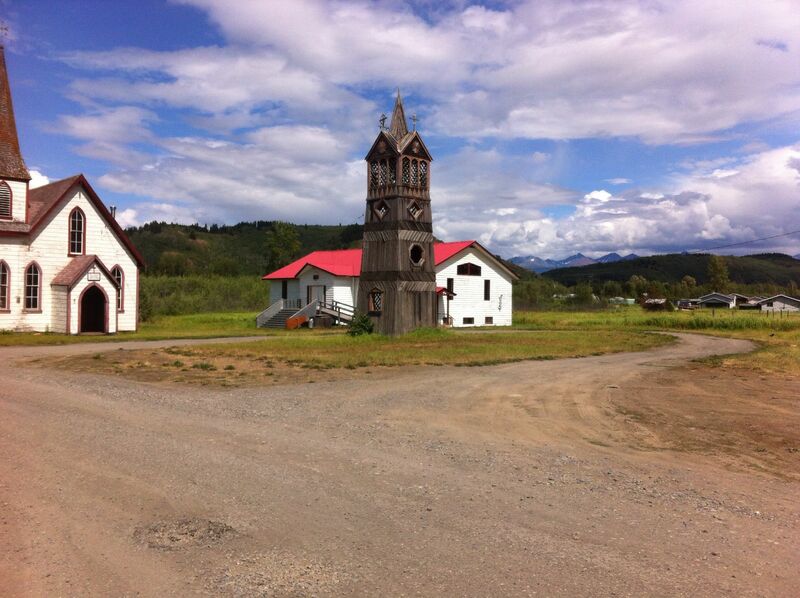 I made good time cruising down hill on an overloaded bike, arriving in Hazelton at noon. As I was enjoying lunch at the farmer’s market, another solo female cyclist pulled up! Unfortunately Lucy was headed east to Prince George, but we enjoyed our lunch together. From Hazelton, the scenery improved steadily until I found myself at the turnoff to the Cassiar highway. Just past the intersection was a magnificent church spire and a set of authentic totem poles (pictures on other camera), backdropped by the Seven Sisters peaks. Figuring it was the last bit of civilization for a while, I stopped at the campground in Kitwanga, where I met a really nice couple (Glenn and Lena from California) on a motorcycle. as we were chatting, Steven and Donna from Texas came over to invite us to their RV site for a pasta dinner, which was wonderful! 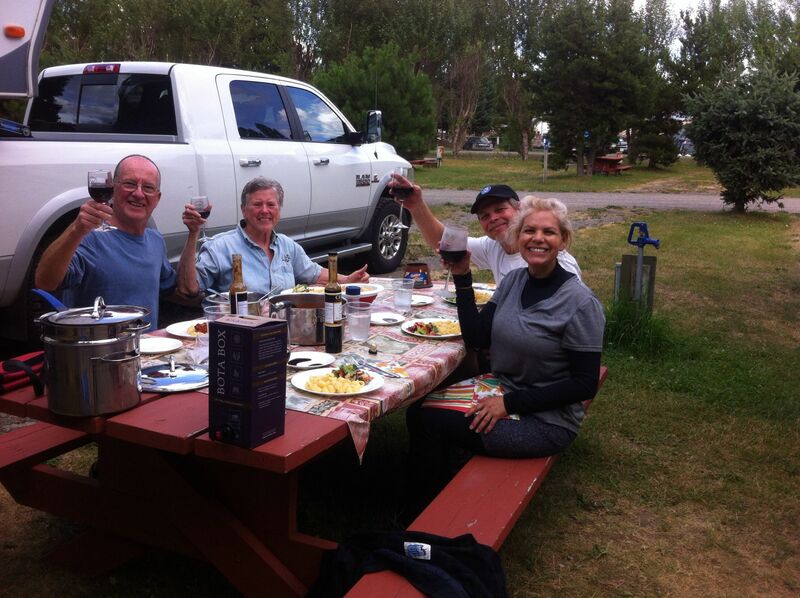 Steven has done several cycle and motor bike tours and loves cooking, so they pay it forward by making campground friends! The clouds rolled back in and it rained most of the night and through the morning. I’ve yet to figure out how to pack up a dry tent while it’s raining without getting the tent wet; by the time I was finished breaking camp, everything was damp and I was cold, even with the assistance of a picnic shelter. It was a consistent rain and seemed like it was going to be a miserable ride, (and a miserable way to start off the hardest leg of the trip) so instead I booked a night at the Roads End guest house/hostel, where I strung up my tent and wet things to dry and relaxed all afternoon as the weather gradually improved. The other guests returned and were quite surprised to find me there- they were under the impression they had private rooms, not a dorm-style hostel. It made for a slightly uncomfortable stay, though warm and dry. The weather is much improved, so north I go! From here it is a 5-day push through the wilderness to Dease Lake (a small outpost) and then another 3 to the Yukon border and Watson Lake( the next real town). Look for next updates in about a week!